Nothing much to report yesterday as we tried to save up all our eating for our grandson’s birthday party. As it turns out we didn’t eat anything and ended the day with some eggs and toast in a quick dinner. Today, though, is Chicken Monday as well as weigh-in day. After being down as much as 5 lbs. during the week, I finish with a loss of almost 4 lbs. Pretty good although I have no idea why my weight fluctuated up. I guess to make me excited and then depressed. Good job scale! Today I start with an English muffin with peanut butter and follow that by a deli ham open-faced sandwich for lunch. For our exercise today John and I are working hard to get things thrown out. There’s a lot of up and down stairs. We go to Goodwill and donate a bunch of stuff and then head over to the dump with a carload of other junk. It is annoying that Goodwill will not take children’s toys and we are forced to dispose of them at the dump instead. Luckily we have our dinner plan well in hand. John pan roasts the chicken breasts and I prepare a mash of last week’s butternut squash mixed with some rutabaga. Our green vegetable is baby spinach in a light white sauce enhanced with nutmeg. It is quite delicious. I have never been a big spinach fan but making it with a little onion, garlic, white sauce and nutmeg makes it really tasty. It is especially nice that I can buy already washed baby spinach in a bag at the store. Most important tip is to make sure your spinach is dry after it is cooked before you put the sauce on. Otherwise you’ll have a liquidy mess. 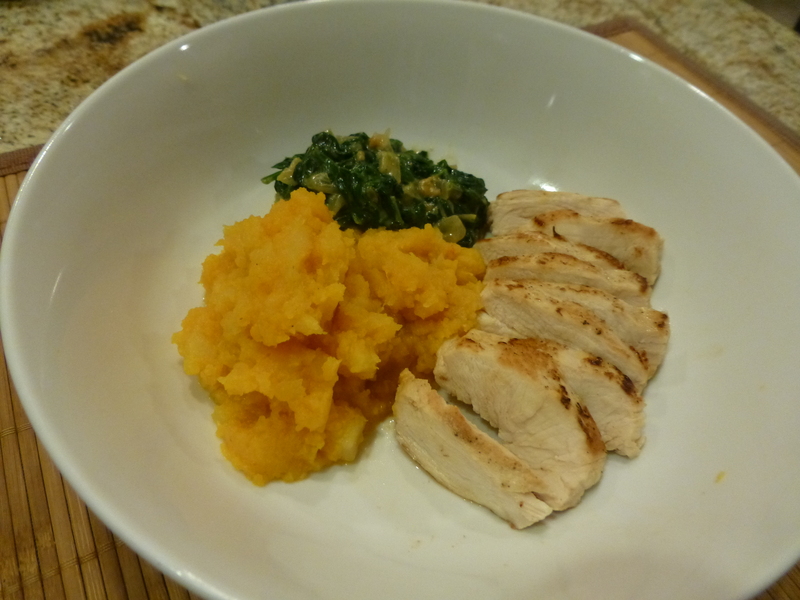 This entry was posted in Poultry and tagged butternut squash, chicken dinner, creamed spinach, diet, English muffin, healthy lifestyle, mash, pan roasted chicken breast, rutabagas. Bookmark the permalink.